In this new monthly column, Trucost calculates the full environmental costs of everyday products. More information here. 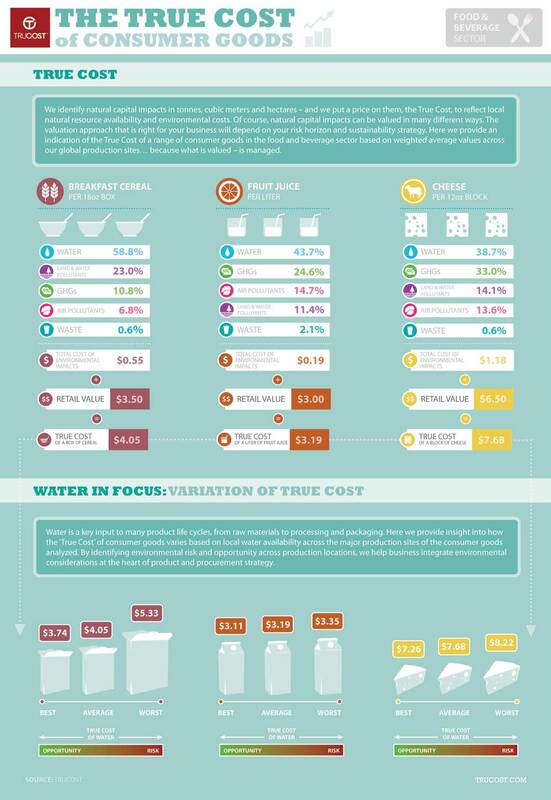 Trucost analyzed three common food products: breakfast cereal, fruit juice and cheese. We examined the stages of production from farm and orchard to the supermarket shelf. The embedded carbon, water, waste and pollution were calculated for generic products in each category. (No brand has been harmed in the generation of these metrics!) Trucost then calculated the “natural capital” cost of each of these. For carbon we used the social cost. For water, a local issue, we correlated the volume of water required to produce the raw materials with local scarcity by gathering data on the location of production and pricing water accordingly. To view the full analysis, click on the image below. The percentages show each item's share of the product's total environmental impact. Our analysis indicates that, on average, the true cost of a block of cheese should be 18 percent higher than the retail price, breakfast cereal should be 16 percent more expensive and fruit juice 6 percent more. Water is the most significant natural capital dependency for all of the products. Unsurprisingly for breakfast cereal wheat is the biggest draw on water in the supply chain. For fruit juice it is orange production and dairy cows make cheese production a thirsty business. Cheese is the most carbon intensive product and fruit juice the most wasteful. This analysis illustrates the scale and type of natural capital cost for each of these products, on average. Note, however, that there will be significant variation when it comes to analyzing specific products and brands. To illustrate how some of these differences could arise we analyzed the variation in water use and scarcity across the top 10 production locations of each product to demonstrate the scale of risk and opportunity. The natural capital cost of using water is driven mainly by water availability at the production site, as well as by the type of water consumed and a range of other factors. For example, areas with high rainfall and less competition for resources will have lower water costs than sites with scarce supplies and over-abstraction. So, to highlight the optimization opportunity we assumed that production was switched from the worst to the best production location of a key commodity and analyzed how this would alter the result overall. The biggest variation was found in breakfast cereal, where the gap between the lowest and highest water cost relative to retail price was a 54 percent. The variation in exposure to water costs for products sourced from different locations was 14 percent for cheese and 8 percent for fruit juices. Clearly, it is not possible to switch large areas of production overnight or make an instant land grab to reduce future risk from natural capital costs. However, depletion of natural capital leads to depletion of the resources we rely on. The problem is an information gap – most businesses have limited knowledge of the impact of their production on natural capital. This information is needed if we are to satisfy increasing consumer demand without destroying our ecosystems. Companies can use natural capital valuation as a tool to embed natural resource considerations within everyday product and procurement decision making alongside other considerations such as cost and quality. Over time, it will be possible to redefine how and where products are made in order to optimize value chains for natural capital. Understanding how low-risk sites are managing resources could lead to improvements in production at high risk locations, while maintaining supply chain continuity. An understanding of natural capital risks can lead to changes in design — for example is it possible to substitute water intensive raw materials to reduce natural capital risk? Whatever the business strategy, natural capital valuation provides a framework to identify risk from natural capital costs and opportunities to optimize business strategies in line with natural resource availability — because what is valued, is managed. Trucost provides data, insight and tools to help businesses to integrate nature into everyday decision making; to optimize operations, supply chains and products in line with global resource availability and natural capital constraints. More information available at trucost.com.